We supply systems "from a single source", including motors and cylinders as well as electronic controls with wiring, including documentation in several languages. 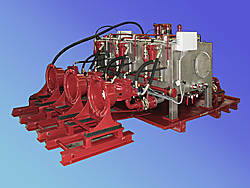 Our systems are used in all areas of mechanical and plant engineering. Certification of Düsterloh Fluidtechnik GmbH according to ISO 9001 : 2008 ensures that the highest quality standards are observed.